A 13th century Welsh castle is set to be sold at auction tomorrow, despite efforts by local residents to stop the sale. Ewloe Castle, in Flintshire county in the northeasten corner of Wales, is to to be auctioned with four other lots which are expected to fetch more than £500,000 in total. Although privately owned, the castle is under the custodianship of Welsh historic monuments agency Cadw, and its character "must be preserved". Ewloe Castle is now a ruin, and Flintshire Council said there are strict guidelines to prevent development and preserve the building's character. Andy Roberts, head of planning policy tells the BBC: "Given the rural location of the castle away from any settlement, the land which it occupies and surrounds it is designated open countryside in planning terms, with much of it also being green barrier which adds to the protection of its open character from development. "The site of the castle and some of the land around it also has environmental designations which provide added constraints on development, and of course it is a scheduled ancient monument, whose character and setting must be preserved and protected." A Welsh Assembly Government spokesperson said: "Ewloe Castle and its immediate area is in the guardianship of Cadw on behalf of the Welsh Assembly Government and is protected as a scheduled ancient monument. Because the castle is in the guardianship of Cadw, this means that the public would still be able to access the castle." Currently, the public have access to the site through a footpath. But many residents fear that this access will be cut off, or that the castle may be altered by developers. A Facebook group called 'Stop the Sale of Ewloe Castle!!!' has over 500 members. Some of the members are calling for Cadw to purchase the castle or that the area be turned into a public park. On their message board, Tim Johnson says, "the castle will remain untouched and remain in the care of cadw but the surrounding land...who knows. Apparently the interest is to use the land for agriculture but if developers get it then i guess it could end up as a castle surrounded by houses." Local historian Steve Griffiths said: “The forthcoming sale of this picturesque ruin has understandably sent shockwaves reverberating through the community. Meanwhile, another Facebook group called 'Lets Buy Ewloe Castle' has also started, with about 65 members. The group wants members who are "willing to pledge money towards the purchase of the castle." The auction will be held at the Beaufort Park Hotel in New Brighton, Flintshire, on December 8th. The opening bid for the piece of land containing the castle is set at £80,000. The entire property is over 24 acres in size. Ewloe Castle was built by the Princes of Gwynedd. Construction began in 1257, with the strategic goal being to control the road to the nearby town of Chester. 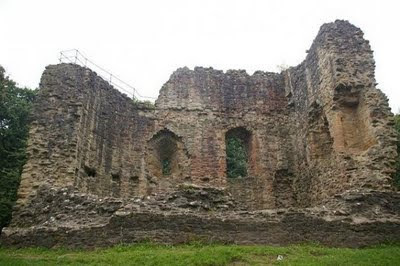 In July 1277, at the outbreak of the Welsh Wars, Edward I left Chester and established an advanced base at Flint, where building work immediately began on Flint Castle. It is believe that during this campaign that the Welsh forces retreated from Ewloe Castle to stronger fortifications to the west. The only contemporary reference to the Ewloe Castle is in the Chester Plea Rolls which mentions a report sent to Edward II in 1311. The Justice of Chester wrote to the King regarding the history of the manor at Ewloe from the middle of the 12th century. The rolls records that by 1257 Llywelyn the Last had regained Ewloe from the English and built a castle in the wood; noting in 1311 that much of the castle was still standing. By the late medieval period, the site was in ruins. Much of the castle's stone was taken away and used in later buildings in the area. The site of the present castle bears some resemblance to that of a motte and bailey, which leads some to believe that the parts of the castle might have been built as early the 12th century.